Options include bi-xenon headlights, a front fascia with carbon fiber bents, a carbon fiber spoiler, carbon fiber and leather interior accents, bigger wheels, leather seating and a commemorative plaque. Additionally, there are several option packages available on the 4C. A Convenience Package adds cruise control, an alarm and parking sensors, while a Leather Package includes leather seating and contrasting stitching. The Track Package consists of some tuned suspension, bigger wheels and race-style seats, while the Carbon Fiber Package adds special trim throughout. For 2018, the Alfa Romeo 4C receives only minor updates, which include optional carbon fiber vents in the front fascia and yellow accents on black leather upholstery. All else is unchanged in the mid-engine sports car. 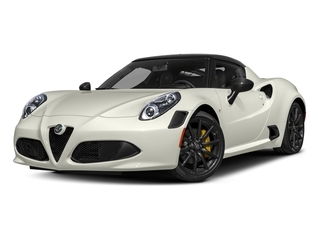 The Alfa Romeo 4C coupe starts at a base price of $55,900, while the 4C Spider starts at $65,900. Both cars compete with sports cars like the Porsche Cayman and Boxster, as well as the Chevrolet Corvette. Rather than try to outmuscle its competitors, Alfa Romeo has instead opted for an approach centered on finesse and balance. With its ultra-lightweight carbon fiber monocoque construction, the 4C is among the lightest cars sold in the United States. The mid-engine design and well-balanced approach means its an excellent handler and one of the best-looking sports cars available.